I'm taking one of those massive open online courses from Coursera, in particular, the Design class and foolishly decided, as my class project, to work on my current obsession, making a beaded sinnet stand. As part of my class, I'm supposed to gather 5 peers who are experiencing the same problem and interview them (among other things, that will be revealed to me as the class progresses). So, I need your help for my class! More on that at the end of the post. 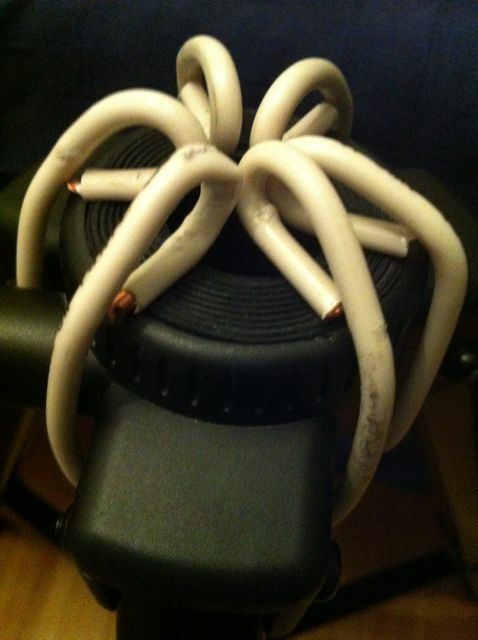 Now, I've made a prototype from a broken camera stand (the ball head mount broke and I asked my husband to remove the centre post because I knew I'd be modding it into a stand of some sort... 8), some heavy duty wire from the hardware store and an elastic band so I can change things. I made wire... frames for both 4 strands and 6 strands as you'll see below. A sinnet is like a braid made from knots. The crown sinnet is known to kumists as the strawberry end knot. The crown sinnet is known to boondogglers by a variety of stitch names, including: circle or barrel, also square and box if done in a columnar fashion rather than spiraling. 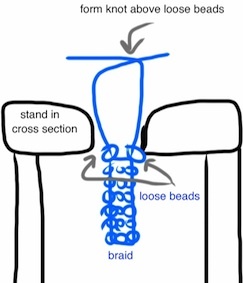 Adding beads to a sinnet, requires the knot to form above the braiding point where the beads sit so that the beads are trapped, sit properly, and do not pop above the knot. Sinnetting (I'm making up a new word!) on a stand is different than braiding because in braiding it's (usually) a simple and symmetric exchange of strands. With sinnetting the extra and usually off-centre manipulation to tie the knots with weighted strands means that the mirror needs to be as small as possible for more stability. So, I am supposed to interview 5 people with similar problems. Let us say, for the sake of argument (and to cast a wider net that might actually catch 5-ish people by tomorrow 9PM EST (Sorry!! I'm a procrastinator... 8( )) the problem is tying sinnets on a stand or braiding with beads on a stand or tying beaded sinnets (by whatever means). What similar things do you make? What tools do you currently use? What annoys you the most about the task with your current setup? What works well with your current setup? What are you looking for in a tool to assist in your task? Please try not to be brief! i have little experience working beads into sinnets, but i do tie many varieties of sinnets. also, i find a whole assortment of buttons can be made extremely elegant with the addition of beads, or using beads as a core. another thought that crossed my mind is integrating beads into a turks head. however, with these ideas that are no longer simple sinnets, the system gets complicated. so, to answer your questions, mostly for the sake of giving you data, as i seldom actually have beads to work with, is how can you stably implement beads into turks heads and make them show up where desired, and also a way to use beads as a core for some elaborate multi strand knots, particularly i was thinking about knots like and emerald knot, or other diamond realatives, that when tied are actualy only attached on one end while the rest just wraps tightly around the rope, leaving an idealy shaped hollow opening which could be filled to make a simple sphereical knot. i make simmilar things in making sinnets, most often pleats but implemented in a single strand. a good project i have made are coasters out of a simple sinnet tied by weaving loops together. i forget the abok number, but you could substitute any flat mat knots. i would like to be able to add beads around the edges. currently these things are tied with massive improvisation and careful tightening, usually tied several times before i find them satisfactory. the task of tightening these mats is probably the most annoying part. also, i don't have a nice quark board to pre-plan the mats, so i have to just tie it as i go. sometimes, i'll read a mat out of abok to tie it, but these elaborate things get confusing with no way to save your work. 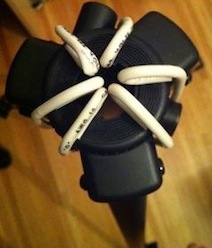 however, when i can get the hang of the knot, i feel a much greater sense of accomplishment when i do it with my set up. i think a nice quark board to map out things would be of assistance. also, i want to point out that a crown sinnet may not be the best sinnet to use here. 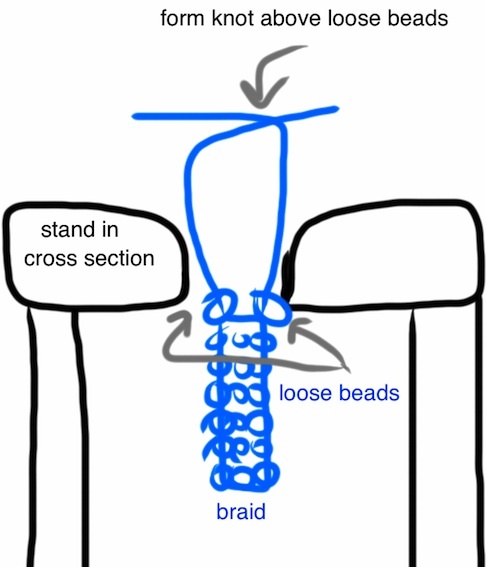 it appears to me that really any type of chain sinnet (tied with interlocking loops, as in krocheing) can be very succesfuly made passing each loop through a bead before passing another loop through it. you may want to try this. hopefully, this is helpful to you, and please pardon my atrocious spelling.